The Headsman Axe is all about precision. It's like using a scalpel instead of a knife. Like using one of those NASCAR air guns instead of a tire iron to change a tire. It's all about efficiency and accuracy. 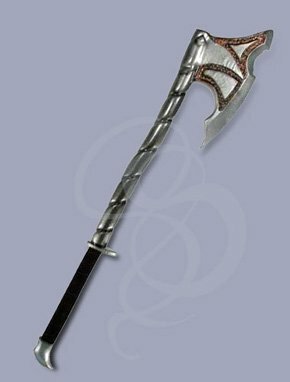 The Headsman's axe is used by executioners to behead their victims. What better axe to intimidate your opponents? This executioner style axe is approximately 34 inches in length and features a long, comfortable grip and a segmented shaft. The axe head is beautifully bearded and carved with menacing designs. The whole assortment is capped off by a hooked pommel on the bottom of the shaft. Like I said, you can't get much more intimidating than this. Maintenance: We recommend that all latex axes be treated occasionally with a silicone lubricant, like the one available below. The lubricant keeps the latex from drying out over time. It also allows for more realistic sliding of axe against axe. This item is a part of our Epic Armoury collection. Epic Armoury LARP axes are rugged, comfortable and beautiful. They are made with some of the toughest foam on the market and coated with a dynamic layer of durable latex. The foam used is a closed-cell type of material that doesn't shred with heavy use like some other foam swords. fax Each axe is cored with a strong and flexible fiberglass rod that allows for excellent transfer of power during swings. The core is swaddled in layers of soft foam to make every blow a safe one. The tips on each of these beautiful axes is reinforced with a proprietary Kevlar cap that keep thrusts safe and ensures that the sword's tip will not break.